We're almost at the home stretch for this year's deluge of Call of Duty DLC. A riveting tale, I'm sure, for those of you who never picked up Call of Duty: Infinite Warfare. What better map to start with than Ember, once again ringing in the old adage of "what's old is new again." It's a remake of Resistance from Modern Warfare 3, one of the iterations I remember the least. I do recall the original Parisian map, and also recall disliking it, especially in the lacking Special Ops mode. Ember is a little better, but not by much. Its towering castles and set of gallows provide a slightly interesting atmosphere, but the effort gives way to the boring layout that's mostly relegated to a set of stiff streets with few sections that host verticality and complexity. Kowloon from the original Black Ops is still one of my favorite maps in the series. Its shanty aesthetic stood defiant against the figurative polish of its brethren, which is especially the case when compared to its shiny future successors. Bermuda brings a sliver of that flavor back. It's design is a little too close to a few existing Infinite Warfare maps (Frost comes to mind immediately), but it's still very much functional. I typically gush over the injection of more silly maps into Call of Duty, and Fore, with its fire-breathing dragon robot, is in good company. I've always said that it's a boon to be able to read signage now that we have more impressive hardware, and the "Rules of Play" poster, complete with its own mascot, adds to the allure of Fore. The same goes for the map that showcases its various themes (Pharoah's Sand-Trap, Magic Forest, and so on) -- this could very easily host a zombies mode in the future. Its sprawling layout also provides tons of nooks to hide in and spring an unlikely trap. I like the idea of a ruined city, but Permafrost doesn't give us anything numerous maps like Ghost's Flooded haven't already done. It's a shame that more areas like the fire escapes aren't accessible, because outside of a semi-intriguing multi-tiered tire shop and one very small underground tunnel, there isn't much of note here. This is going to be an arena I'm struggling to remember in a year or so from now. 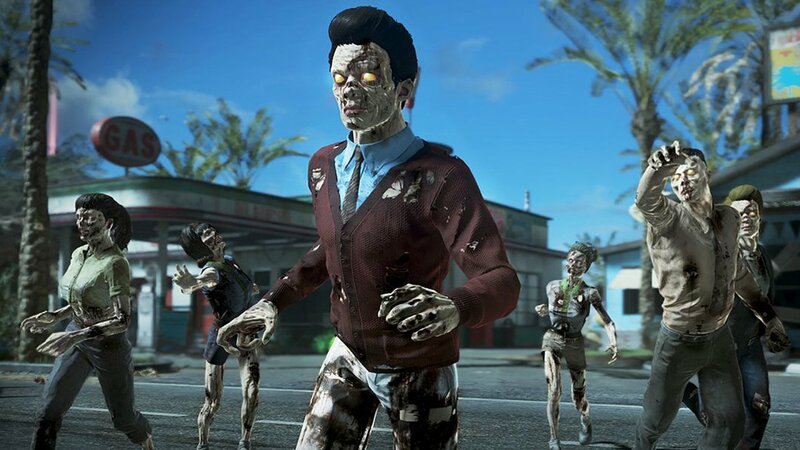 The first zombie map drew inspirations from David Hasselhoff, the second, Kevin Smith, the third from Pam Grier, and the fourth (Attack of the Radioactive Thing) focuses on Elvira, Mistress of the Dark. All of these personalities are no strangers to camp, including the overarching host of Paul Rubens, which is why I feel that Infinite Warfare has one of the most fun zombie modes yet. Ike Barinholtz, Jay Pharoah, Sasheer Zamata, and Seth Green return again to lend their talents to the same continuity, and it pays off. There's at least one TV special's worth of the wonderful Hanna–Barbera style animation already, but the '50s black and white visuals employed for the map itself is what really gets me -- it makes the delight of full color popping up even more fun. Requiring a lot of legwork to even turn on the power (and thus opening up more upgrades) is also a welcome change of pace. This is on top of the already strong glue holding it together with a progression system and that glorious Atari retro arcade in-between revives. It's great that Activision's various teams can still come up with original ideas, and shooting dapper/greaser zombies while surveying bits of Americana like fake hot dog mascots and swap-meet listings definitely counts. Infinite Warfare has had an uneven Season Pass but it's far from a disaster. While its first pack is easily the strongest, even the average maps in Continuum and Absolution are worth occasionally cycling through. Just err on the side of zombies and you won't regret picking it up -- otherwise, Game of the Year it is.